For women who like to make a fashion statement every time they walk into a room, a couture outfit isn’t enough. The outfit must be complemented by the perfect pair of earrings, a dazzling necklace and of course, a stylish ring. Whether you’re looking for rings to pair with a beautifully hand-woven saree or a stylish gown, we at BlueStone have an extensive range of rings for you to choose from. Our Imperial Nest ring designs are particularly noteworthy when you need something bold, beautiful, and majestic. Anniversaries, engagements, weddings, weekends, cocktail nights or special occasions, you are sure to find the right ring from this majestic collection. The cluster setting is very popular and trending these days as the perfect choice for engagement rings and cocktail rings. When it comes to rings, the bigger the diamond, the bolder its appeal will be. However, diamond sizes are also directly proportional to their price. Large diamonds may be a little out of your budget, but their appeal need not be. 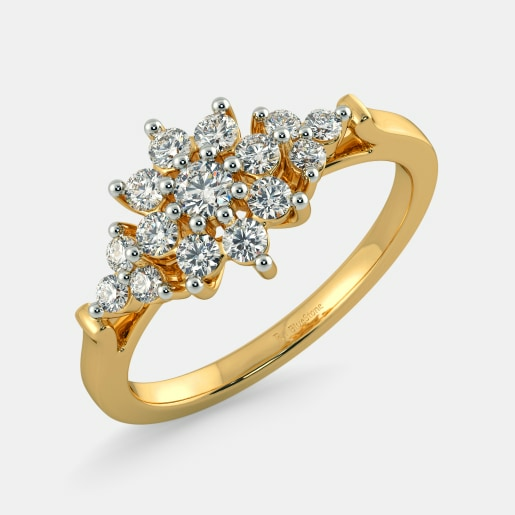 Cluster rings like the Nabha Ring feature a number of small diamonds set cleverly and closely together so as to give the appearance of a bigger stone. While the combined carat weight of these diamonds may be equivalent to the carat weight of a large diamond, the price is considerably lower. This gold stunner is ideal for engagements, anniversaries and weekend parties and it will grace your fingers elegantly no matter what you pair it with. Large precious and semiprecious stones are not as expensive as large diamonds and this makes them a very popular choice when it comes to cocktail rings. If you want the stone to look even larger than it is, take a look at rings with a halo setting. This setting places the large gemstone in the centre and encircles it with a number of small diamonds. Princess Diana’s Blue Sapphire engagement ring that is now worn by the Duchess of Cambridge is the most famous example of a halo setting. 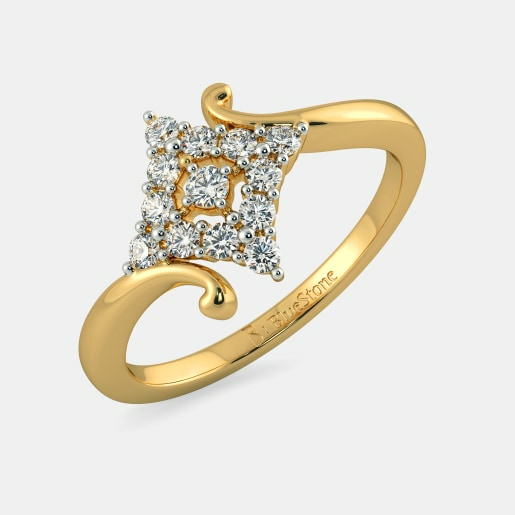 The Ziva Ring is one of our bestselling halo ring designs from our Imperial Nest collection. Made of 18kt gold, the ring features a pear –shaped emerald set amidst a halo of round-cut diamonds. 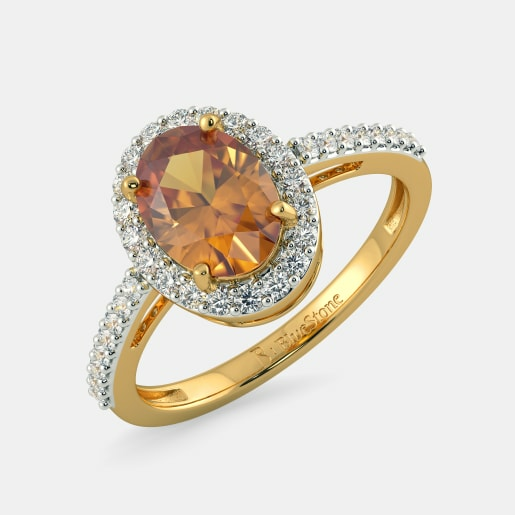 The Solaris Ring follows the same pattern, except that it has an oval-shaped citrine as the central stone. Gemstones do not necessarily have to be big to make a powerful style statement. Pave-set rings like the Fashion Finesse Ring literally pave the ring surface with diamonds and gemstones. 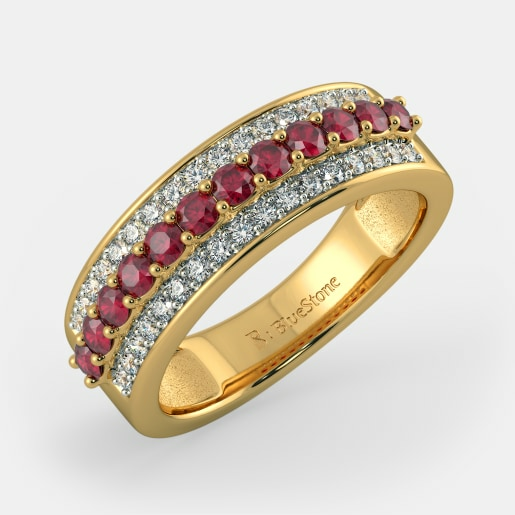 Made of 18kt gold, the ring is a celebration of the ever-charming red and white combination. By setting the rows of diamonds and rhodolites close to each other, it seems to exude a seamless sparkle. Apart from diamonds, there are three other gemstones that are considered precious – emeralds, rubies, and sapphires. When you buy Imperial Nest ring designs online, pay attention not only to the colour and size of the stones being used but also the way they have been cut. Gemstones can be cut different of ways, from round, oval, and pear to princess, marquise, and trilliant. The Florine Cocktail Ring features a number of round diamonds while the Epitome Luxuriate Ring pairs round-cut diamonds with a pear-shaped emerald. The Licorice Ring is a fine example of marquise cut and features four marquise-cut yellow sapphires set amidst a number of round diamonds. This cut not only makes a gemstone look beautiful but also makes it look bigger than it actually is. Want to choose a gift for a woman in your life but not sure what to buy? Trust us when we say you can never go wrong by gifting a woman a piece of jewellery that suits her style. Rings with precious and semi-precious stones are ideal birthday gifts and anniversary markers. When it comes to buying a ring as a gift, the stone being used could also be significant. Each month of the year is associated with a particular gemstone. So, while the diamonds in the Princess Ring makes it the ideal birthday present for a woman born in April, the sapphire-studded Moonwalk Ring is perfect for a woman who celebrates her birthday in July. Similarly, wedding anniversaries are also marked with gemstones. While diamonds mark a couple’s tenth anniversary, the perfect ring for a third wedding anniversary would be a pearl-studded ring like the Sabina Ring. With BlueStone, whether you’re buying jewellery for yourself or as a gift for someone else, the experience is always enjoyable. Not only do we offer a wide range of designs for you to choose from, we also give you the opportunity to get them custom-made. We understand that today, not everyone likes the look of gold and hence many of our designs can be custom made in white gold as well. 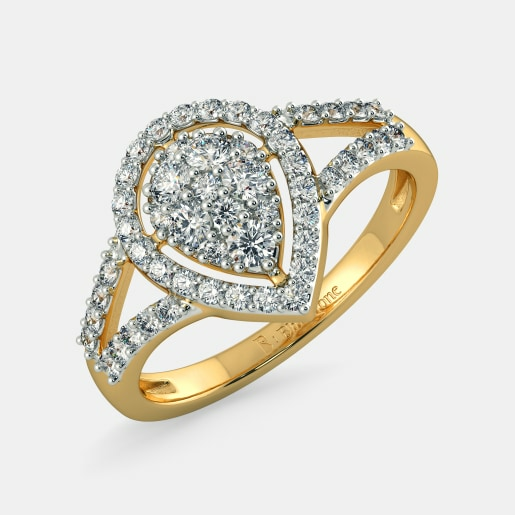 Both gold and white gold share the same carat system and hence this has no additional costs associated with it. However, if you are looking for a way to reduce Imperial Nest rings prices, you could choose to lower the caratage from 18kt to 14kt. You can also change the cut and clarity of the gemstones used on the ring. While this can help make a ring fall within your budget, it does not affect the design. In addition, BlueStone also gives you the opportunity to try on a piece of jewellery before you buy it. This is very helpful for women who find it difficult to make a selection without seeing how it looks when worn. So, if you can’t make up your mind between two or more designs, let us know and we’ll send them home for you to try on. Things can’t be better, can they?